History: was formed by L. van den Bergh on June 1 1966 to operate air-taxi and local sight seeing tours from its Antwerp base with three Cessnas. Gradually general charter work was included with the delivery of the robust DC3. When on November 1 1966 Sabena ended its helicopter services to Eindhoven & Rotterdam, a contract was sought to operate these services and two factory fresh Beech 65 were delivered. Finally the contract was granted to BIAS and the aircraft were used on their air-taxi services. But soon one of the Beech found work when in 1967 a contract was signed with KLM (which later on would take a stake of 33%) to operate a scheduled pax and cargo services between Antwerp & Amsterdam which started on September 19, upgraded to a DC3 in 1968 followed by CV440's in 1972, Nord 262 (1976), FH-227 (1977) and Brasilia (1988) aircraft. The inaugural flight took off on September 19 1967 and would last thirty years ending on March 29 1997, funny enough with the Brasilia wearing Air Meuse colors. The next day KLM took over this link which on its turn ended on July 1 2002. 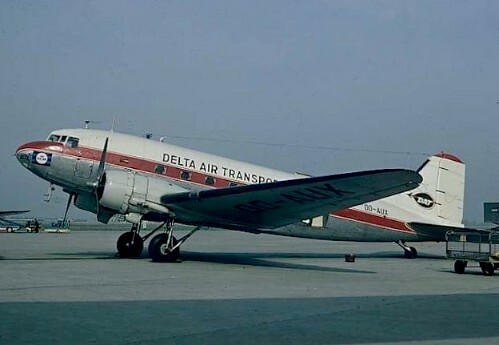 The BIAS contract with Sabena on the service to Holland was already ended by August 1968 due technical troubles with the aircraft and a new, but definite, contract was signed with DAT to operate on their "Common Market Commuter" network. One Beech 65 received even the colors of the former Belgian flag carrier. The piston age ended in 1978 with the sale of its last DC6 and during the transition between piston and the arrival of "new" props, two Nord 262 were temporary leased. During 1974 an attempt was made to operate a B720 on world wide charters from Brussels, but failed a couple of months later. During a six month period in 1984, one Fokker was leased to Crossair of Switserland, repeated in 1985 due to engine troubles with their new Saab 340. In 1986 Sabena took a stake of 49% in DAT and gradually more and more flights were made on behalf of Sabena. During 1988 the company was renamed to DAT (Belgian Regional Airline) and in 1996 they became a wholly owned subsidiary of Sabena. All aircraft ended up in the colors of the Belgian flag carrier and their HQ was moved to Brussels. With the collapse of Sabena on November 7 2001, the subsidiary would ultimately survive and took over most of the European and African network. Its new name "SN Brussels Airlines" was officially adopted on February 15 2002. On April 12 2005 SN Holding took full stake in Virgin Express, and on March 31 2006 it was announced that the low cost carrier would be merged with full service airline SN Brussels Airlines. On November 7 2006, exactly five years after the bankruptcy of Sabena, the new name and corporate identity was unveiled: Brussels Airlines and the airline became operational on March 25 2007.